Beyonce made an appearance last week at adidas Originals x Kanye West YEEZY SEASON 1. She was styled by Zerina Akers. 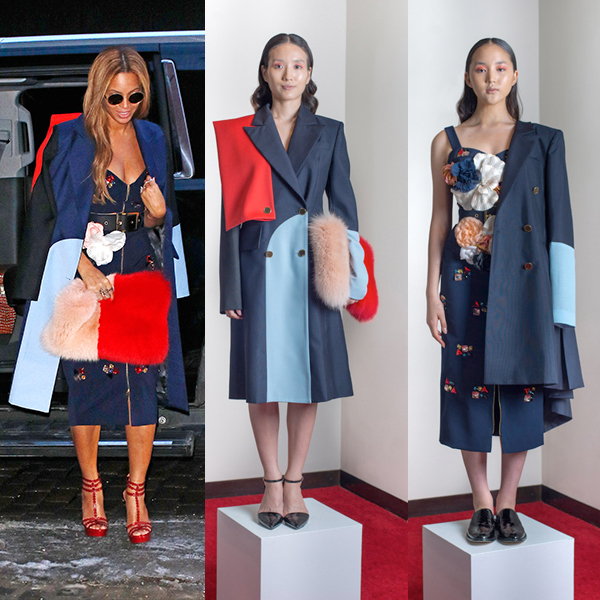 She wore the Navy Wool Mosaic Overcoat, Navy Four-Ply Silk Crepe Encrusted/Embellished Bustier, and Navy Four-Ply Silk Crepe Encrusted/Embellished Belted Pencil Skirt W/Front Zipper. All pieces are from the Harbison Spring 2015 Collection. Beyonce was later spotted last week, arriving at the 40/40 Club in New York City, after attending Kanye West’s fashion show. She was again styled by Zerina Akers. She wore the TRIPP NYC Lace Up Pants, which you can purchase online at PatriciaField.Com for $98.00.